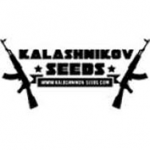 Kalashnikov Seeds - Vodka Lemon. Free US delivery. Vodka Lemon is a powerful combination of an Afghani female plant with a male Amnesia Molotov which makes for quite a stunning cocktail. Although it is 60% sativa it grows just like an indica plant with fat colas. High THC strain with thick, rich smoke. Vodka Lemon can reach a height of 140 cm. indoors and much bigger if planted outdoors directly into the ground. In 60 - 65 days of flowering indoors it is able to produce yields in the region of 500 - 550 gr/m2 while outdoor yields are between 900 - 1300 gr/plant. Its Afghani genetics are reflected back in the density and power of its buds. Both the scent and the flavour of this cannabis strain is very strongly of sharp lemon. THC production is 23% and when smoked produces a thick, rich smoke which has a psychedelic, sativa character that fills you with energy. Great for active pursuits outdoors.